I paid for this device myself and am not paid or endorsed by Jabra. I have tested this device in my day to day activity. My thoughts apply to my usage and my situation which may or may not apply to your habits and use cases so you will have to ultimately decide for yourself. I'm not here to go through speeds and feeds to you. If you want the specs you can go visit the manufacturer page here. The Elite 65t headphones are not ear buds. They are truly in ear and give you the underwater feeling. This can lead to better noise isolation and a tighter seal in your ear canal for richer sound. Some may consider this a pro for audio quality but a con for comfort and usability. Audio quality is good, not great or excellent. The Elite 65t offer a more neutral audio profile than some of its competitors. Both the Airpods and the SoundSport Free offer better audio quality (at least to my ears) in a dead quiet room, but in real world usage if you take the noise isolation into account I think the Elite 65t's shine through. On a subway or busy street the better audio quality of one of the other pairs would just get drowned out by the ambient noise, even when cranking the volume up. Bottom line is I don't think this market segment can really compete with over ear headphones or some of the active noise canceling headphones purely from an audio quality perspective. If you are looking at truly wireless headphones they are primarily used for convenience and portability, thus audio quality will be a minor trade-off. I have non "standard" ears and have had an extremely difficult time over the years with finding headphones that would fit my ears. This basically translates to headphones that would not stay in my ears during workouts or generally feel insecure, loose, or uncomfortable. Jabra has done well though, because I did not experience these issues with the Elite 65t. With the stock pair of tips (which I believe is a medium size), they fit pretty comfortably in my ears. I worked out at the gym with them and they felt secure. They can get slightly uncomfortable during long durations of listening for me. They are light weight and you hardly notice them when you get used to it. I feel like they really conform and are designed to shape to your ears. 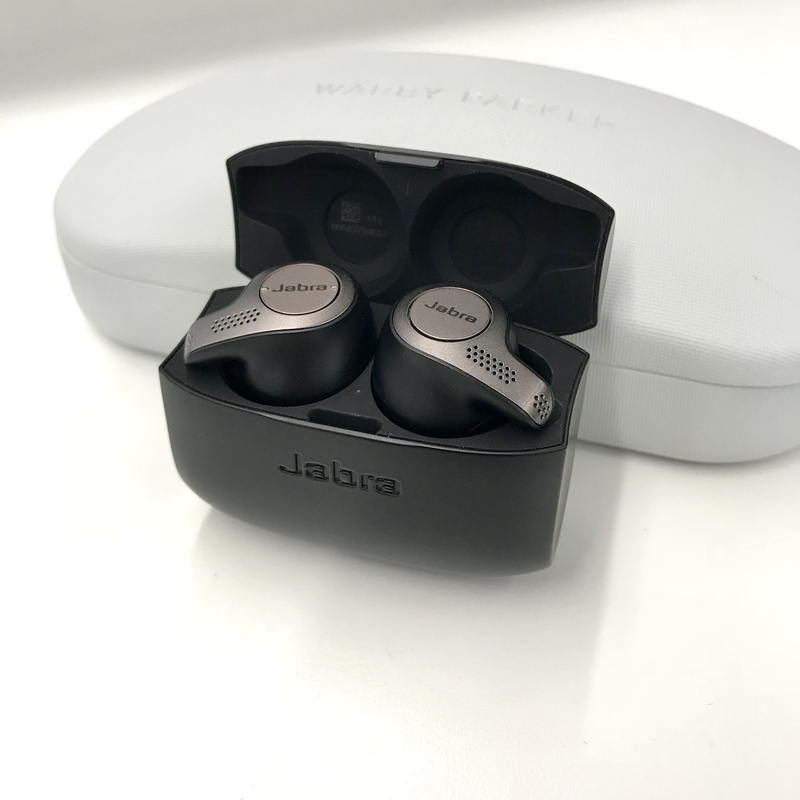 Looking back at the in ear "under water" or "earplug" experience from a comfort perspective, Jabra mitigates this by allowing a "hear through" mode that brings in background noise so you can hear your surroundings and your own voice. Wow what can I say. There's nothing from a feature perspective it doesn't have. You can pair multiple bluetooth devices. Pairing on a PC or Mac works great too. I didn't run into any audio or video synchronization issues like I did with the Bose SoundSport Free. The pairing process is easy and painless. You can keep multiple devices paired and in use at the same time. In contrast, with the Apple Airpods you can pair all of your iDevices but you can only use 1 at a time. Jabra has included an iOS or Anroid app you can use to customize your listening settings. There is an adjustable Equalizer. There is also a setting called Hear Through which allows you to customize how much background noise comes through. You can granularly control the settings for music vs audio calls. It generally works fairly well although I've noticed that sometimes it feels a little uneven where I hear the background noise come in more through one ear than the other. There are some default settings for a focus mode, commuting mode, etc that work ok, but I generally just use the settings I've found work best for me. So far I've been getting about 6 hours of audio playback. The case gives you approximately 2 more charges. I've noticed Jabra's quoted times are a little conservative. Audio call battery life is great as well. No major complaints - it will last you when you need it to. For comparison I was getting 4-5 hours on the Apple Airpods and 6-7 hours on the Bose SoundSport Free. I don't think I would ever be in a situation where I could use them for the full duration without needing to take a break, or breaking for another reason. They are made of gray plastic, but the earbuds themselves have a premium feel. The buttons are clicky but can feel a little cheap. I don't like the experience with the buttons because I feel like I have to press them uncomfortably into the direction of my ear. However, they have a very minimal profile. The microphone array looks sleek. If you use them at work like I do, they look industrial and professional unlike the Apple Airpods. The case on the other hand is where Jabra really dropped the ball. It is plastic like all of the competitors, but it honestly just feels cheap. The locking mechanism is a little plastic snap. There is no release mechanism, you just pop it in and pop it out of the closed position. I think it will wear over time. Both the Apple Airpods and the Bose SoundSport Free have much better case opening / closing mechanisms. It also lacks magnetic contacts, so you have to position the headphones properly in the case for them to charge. I think this could have been a minor and inexpensive addition for Jabra to implement. It's 2018 and plenty of competitors have paved the way for the standard case user experience. I also don't particularly like the placement of the battery LED indicator - but that is really just nitpicking. There is a lot to love about this pair. That being said they aren't perfect either. Today I think they offer the best blend of features, functionality, and quality that you can find on the market. I don't believe that there is a no-compromise option on the market today. There are ultimately some trade-offs you are going to have to contend with. Thoughts? Questions? Comments? Let me know in the discussion section below!